i mean, there is the option where there's a chance that upon killing the mob a new mob of the same type is spawned instantly in its place to resume the fight, and an option where the same thing happens but its a horde (multiple mobs in its place of the same type as the one killed). just play around with the configurations, you'll spot it eventually. ..or maybe the hordes was a side effect of running the epic siege mod along side this mod when ever the instant mob revive occured. dunno anymore; its been a while. You can. 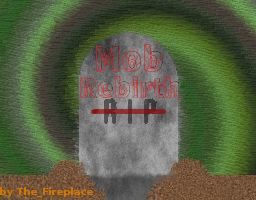 Set the default rebirth chance to 0, then add custom mob settings for the mobs you want to respawn, and set the chances for them to what you want. It doesn't seem to work at all. For example, I tried the stray. I tried both minecraft:stray and stray, and set the chance to 1. Also in the "mobs" folder there was an empty "minecraft" cfg file. I can see and modify the mob list only in game, and the data like the chances don't seem to get saved (exiting and re opening, the value is again at default). Which mod version is having this issue? The new beta for 1.11? The new beta for 1.11? I figured. It is marked as a beta for a reason. Thanks for saying something, I will fix it when I get the chance. Thanks for the update Fireplace. It uses the rebirth chance, and animal rebirth must be enabled. nevermind I found the option. Sorry about that. What suggestions do you have to help me improve it? It'd be easier to blacklist one mob than to whitelist a bunch of them, for starters. Something that I dont wanna do.